North Carolina has pretty awesome weather, but along with that comes pretty awesome bugs and bites. Enjoy your outdoors without all that. Just the possibility of encountering mosquitoes and their ill effects are often enough to keep many people indoors, foregoing all outdoor enjoyment. A screened deck is first and foremost a barrier between you and mosquitoes as well as all other bugs and insects. 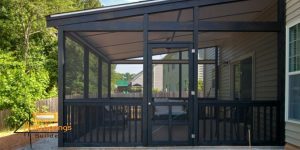 With its roof overhead, a screened patio provides protection from the scorching sun, preventing sunburn. Equally beneficial, it offers shelter from the rain, enabling you to relax outdoors regardless of the weather. 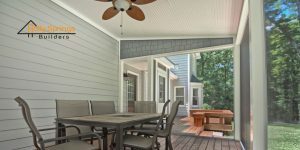 A screened deck becomes an extension of your home, offering expanded space both for your family’s leisure and for gatherings of guests. Or you can even have both! 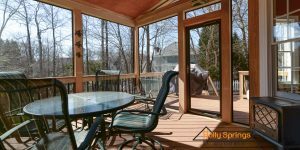 Have a screened 3-season room along with a completely open to the sunshine deck. 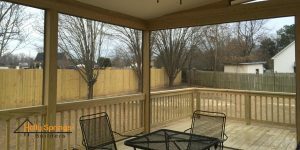 Holly Springs Builders uses SCREENEZE® so it is easy to screen in just about any area. 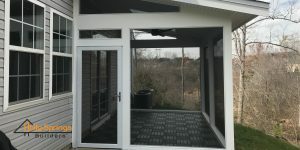 SCREENEZE® can be installed in an arched opening as well as a square space and attach to any smooth, uniform surface. Our customers also like the newer, less visible screening material we are using. 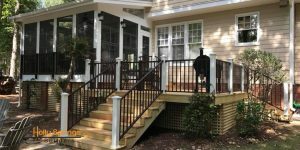 Give Holly Spring Builders a call 919-346-0678 and we will come out and give you a free estimate on screening in your deck or patio. All of our work is Guaranteed for 1 Full Year. If there are any defects in our workmanship, we will promptly return to resolve the issue – At No Charge to You!